The smell. The texture. The taste. The history. Bread is truly a joy to make and a joy to share with others who feel the way we do. The bread you are about to enjoy has been made using only the best ingredients, natural starters and absolutely no added preservatives. Our baking methods follow time-honored European traditions and techniques. The extra time and care we take creates exceptional rustic bread with more flavor, a richer color, a chewy, moist texture, and crisp crust. One of ACE Bakery's founding principles is that businesses have a social responsibility to support the community that supports them. ACE donates a percentage of its pre-tax profits to local charitable organizations, with a focus on funding food and nutrition programs to assist low-income members of the community, financing culinary scholarships, and supporting organic farming initiatives. ACE bakes over 30 different varieties of bread, our baguette being the most popular. For more information about our complete line of artisan breads call us at 1-800-443-7929 or visit our Web site at www.acebakery.com (opens in new window). Unlike most others, our donuts are still made fresh, in-store each day! With donuts from the Baker's Oven you get old fashioned taste at old fashioned prices. We have over 30 varieties from which to choose - and they're all made fresh everyday! Our over-sized, authentic New York Style bagels are water-boiled to create their distinctive crust. Each mouth-watering variety has that irresistable dense and chewy bagel shop quality. Choose from our generous selection: plain, cinnamon raisin, blueberry, egg, onion, pumpernickel, marble, sesame seed, poppy seed, whole wheat, and everything (sesame seed, poppy seed, onion, garlic toppings). Tops is the place for freshly-prepared, mouth-watering desserts including tieumisu, napoleons, lava cakes and more. 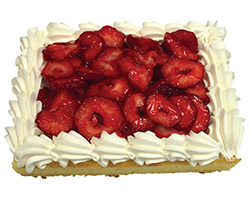 You won't be able to resist the creamy texture and delicious variety of flavors we offer in our Bakery. Including Creamy N.Y. Style, Marble Swirl, Strawberry Swirl, White Chocolate Raspberry, Tiramisu and Chocolate Cheesecake. Choose a cake category below for more information. Custom decorated cakes are our specialty! Our talented Bakery staff will help you create the perfect cake for any occasion. Choose your own combination of cake batter and frosting from our wide selection. Cake flavors include moist yellow, Devil's Food, white, carrot and marble. Half yellow and half Devil's Food cakes are also available to order. Our creamy frosting selection includes traditional buttercreme, chocolate buttercreme, whipped vanilla or chocolate, cream cheese, peanut butter buttercreme, chocolate fudge and REAL whipped cream. 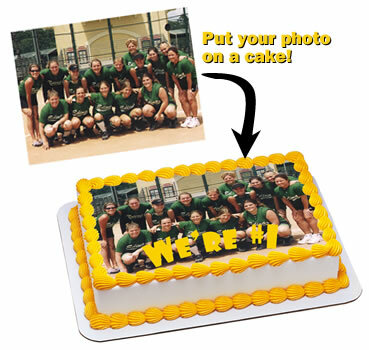 Create an edible memory with a custom photo cake! Photo-imaged cakes are a unique way to truly personalize any celebration. Simply bring your photo of choice to our Baker's Oven where our professional cake decorators will create a masterpiece just for you. No time to special order? No problem! Just stop by our Baker's Oven and choose from our ready-to-go selection of beautifully decorated cakes. When you've decided on your favorite, we'll personalize it with your special celebration message while you watch. Allow our cake experts to answer your questions and guide you through the easy ordering process. You can select your favorite cake batter and icing flavor, add a personalized message, or choose from hundreds of decorating options! Our delicious tiered cakes serve 48 guests or more. TOPS also offers the freshest deli meats, salads, seafood, fresh fruit and floral selections all in one place. There's no need to run all over town to find the best prices on all your party needs! Contact the Bakery Manager at your neighborhood TOPS Markets® and schedule an appointment to discuss your event. We'll help you create the perfect party! 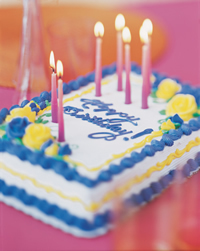 Add an element of fun and excitement to any celebration with a delicious novelty cake from our Baker's Oven! We have original everyday selections, as well as seasonal specialties that change throughout the year. 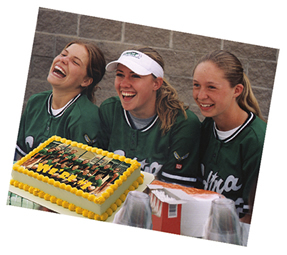 Planning a birthday party, game-day get together or other special event? Then we have the perfect dessert to please all your guests! Choose from our fun selection of cakes including Dinosaur, Sponge Guy, Spider Guy, Brown Dog, Football Helmet and Football. 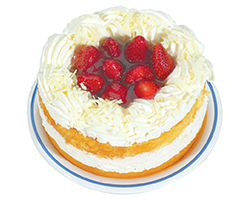 Stop by the bakery department at your local TOPS, or order online through our Great Entertaining website. It's not a party without a Carvel! Made with layers of vanilla and chocolate ice cream, chocolate crunchies and whip frosting. Celebrate the little things in life! Made with layers of vanilla and chocolate ice cream, chocolate crunchies and whip frosting. Indulge family and friends! Each ice cream cake is made from distinctly irresistible flavors that are sure to be a favorite among adults and kids alike. Start a holiday tradition with Carvel's unique shaped holiday cakes. Made with layers of vanilla and chocolate ice cream, chocolate crunchies and whip frosting. Sure to be the life of the party! Made with layers of vanilla ice cream with mini M&M’S® and milk fudge dispersed through the ice cream, a layer of chocolate crunchies; and decorated like the yellow "M&M'S"® character. Satisfyingly Delicious! Made with layers of Carvel® peanut butter ice cream with SNICKERS® candy pieces, chocolate coated peanuts and caramel swirl, and chocolate crunchies. Enjoy delicious Carvel ice cream any day of the week! Great served alone or add your own toppings for a truly decadent dessert! Choose the perfect Carvel ice cream cake for your special celebration and have it personalized with your own message at our Baker's Oven! ®/TM M&M’S, the letter M and the M&M’S Characters are registered trademarks of Mars, Incorporated and its affiliates. ©Mars, Inc. TM®SNICKERS is a registered trademark of Mars, Incorporated and its affiliates.